All hands on deck. Josh Knox and Ted Synnott join forces to finish a chair frame. Helen Gerry, Manager, Centre for Fine Woodworking, New Zealand. Lou Fuller, designer maker and technician at the Centre For Fine Woodworking, Nelson, NZ. As the full-time students came to the end of their studies, Geoff Korver was teaching a short course in woodcarving. Robert Godoy with one of the pieces that will shown at the exhibition of graduate work opening December 7, 2017. Lance Palmer completing a lid stay for a chest completed at the school. Having completed a series of challenging projects, Vanya Smythe had one more piece to get across the line. Two of the people who were fully absorbed in learning new skills at Geoff Kover's woodcarving class. Finally! Lead tutor David Haig and a few of the full-time students begin to survey their achievements. Nestled behind a stunning, heritage listed garden in a picturesque valley just outside of Nelson in New Zealand, the Centre of Fine Woodworking is undoubtedly one of the jewels of the woodworking schools of the world. 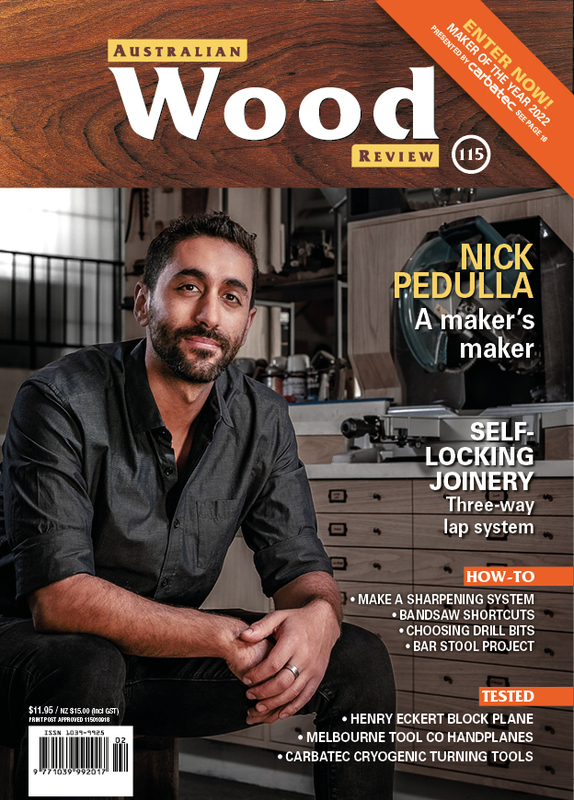 Founded in 2006 by fine woodworker John Shaw, the school has now welcomed over 1500 people into its short and full-time programs which cover every facet of woodworking and furniture making. Two days before the graduate exhibition opening, the workshop was a blur of activity. Surprisingly there was a flurry of shaping, sanding, scraping, fitting, coats of finish and even glue-ups that were taking place. How could all this be happening so close to the finishing line? However, there is something miraculous about the results that a deadline can produce. Seven people, all men this year, aged from 25 to 70 have created an extraordinary collection of work in just under eight months. Viewing the pieces as they were carried into the exhibition space it was truly a vision of the impossible dream. Some of these people had literally never picked up a chisel before, let alone sharpened or put it somewhere! Of course there is a team of people that makes this not-for-profit organisation hum. Helen Gerry, operations manager since 2008 is a warm-hearted and passionate advocate for the school. Her desk, covered with mounds of papers, books and more sits near the entrance. This is the nerve centre, the nexus point where everything and everyone is brought together. When I visited Lorraine Moss-Smith showed me around. This accomplished and vivacious woman is one of the CFW’s trustees as well as a fine furniture maker who was recently an intern in the workshop of Canadian furniture designer and maker Michael Fortune. Lou Fuller is everywhere and constantly in demand throughout the centre. Currently a teaching assistant at the centre, she maintains machinery and equipment and is the go-to woman for advice and answers to just about every question. A graduate of Buckinghamshire College in High Wycombe in the UK, Lou has worked as a furniture designer maker in New Zealand for several years and also completed internships with Michael Fortune and most recently at the Anderson Ranch Arts Centre in the USA. On the morning of December 5, tutor Thorkild Hansen was moving fast, helping those who needed it, well everyone actually. ‘Thorkild, does this need another coat of finish?’ The look said it all – if you need to ask…. In 2017 David Haig once again took on the role of lead tutor, instilling the foundations of skills and perceptions that would skyrocket this cohort into territory which, as mentioned earlier, was new for most. Coupled with intense focus and effort the results speak for the brilliance of his teaching. In the latter part of the full-time course the baton was passed to David Upfill-Brown who pushed the group further and literally, in terms of steambending, around the bend. For those loading the vans, driving into Nelson town to the exhibition space, unloading, positioning and then finally standing back with a celebratory beer, you could see the tension begin to melt away and transform into a palpable sense of achievement. The exhibition opens tonight. If you can possibly get there, make sure you do!